"What were you arguing about along the way?" They had been arguing about which one of them was the greatest, and so they did not answer. "If you want the place of honour, you must become a slave and serve others!" "When you welcome even a child because of me, you welcome me. And when you welcome me, you welcome the one who sent me." 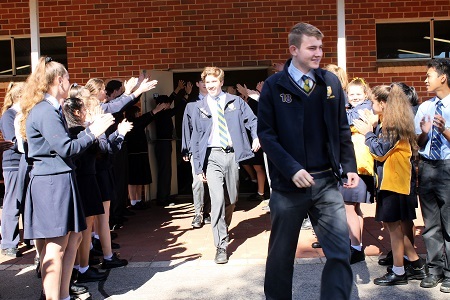 Our Year 12 students concluded their formal classes this week. 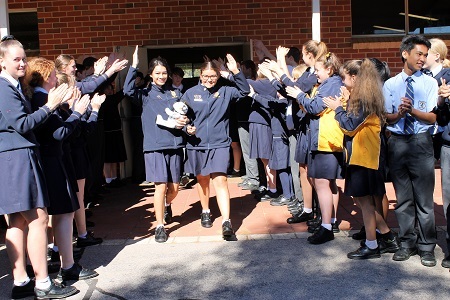 They were farewelled by the staff and students at the Student Leaders’ Assembly this week and given a Guard of Honour as they left the hall. Year 12 students will now be preparing for their final school examinations next term and then the ATAR examinations in November. Non ATAR students will be finalising their assessments in their subjects and completing final VET requirements. We wish our students well and good luck. They will end the term with their Year 12 Ball tonight as a celebration of their preparation into adulthood. 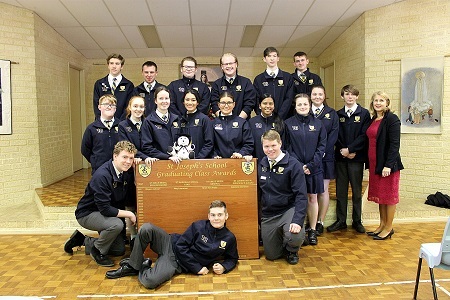 Their Graduation activities will occur next term and we look forward to acknowledging these students at our Presentation Evening in November. Thank you to Mr James and our Year 6 students for their very entertaining Assembly this morning. All our favourite Fairy Tale characters appeared - with a twist! No Merit Certificates were presented and these will be held over until our first Assembly in Term 4. Thank you to Ms Frost and her team of many helpers. I wish to acknowledge the enthusiasm and participation of our students who gave of their best and always show good sportsmanship. Well done! Students will return on Tuesday 9 October in correct Summer uniform. 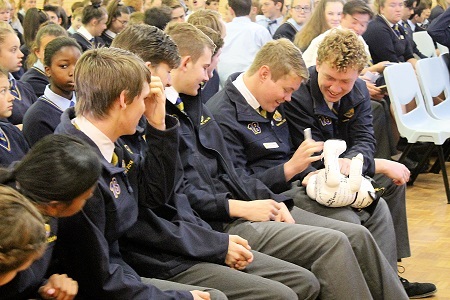 As they will have grown since they last wore this uniform, we ask parents to attend to issues such as hems that need to come down, new black lace-up shoes (not Mary Janes or sneakers), and the need for haircuts for some of our male students. It is disappointing for teachers to need to speak to students about these matters on the first day of term when they have had ample time to attend to these matters. We thank you for your support and cooperation in these matters. We remind our parents and caregivers that Monday 8 October is a staff Professional Development day. We wish all our students and their families a wonderful and enjoyable break together. Keep safe and we look forward to welcoming you back next term. 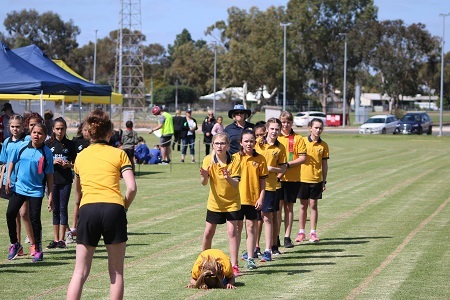 Congratulations to all students who competed in the NSSA Athletics Carnival that was held. 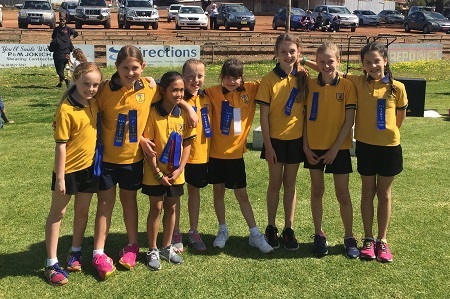 These students represented our School with pride showing outstanding sportsmanship towards everyone involved in the carnival. Thank you to Ms Frost, Ms Muzzarelli, Mrs Dymnicki, Ms Hince and Mr Roberts as well as our wonderful parent volunteers for organising and assisting on the day. 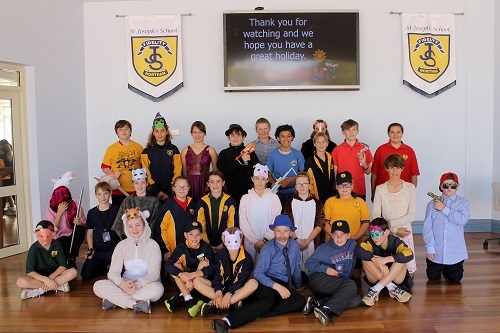 On Tuesday 18 September a selected number of Years 5 and 6 students travelled down to PLC Junior School to participate in the annual Junior daVinci Decathlon. 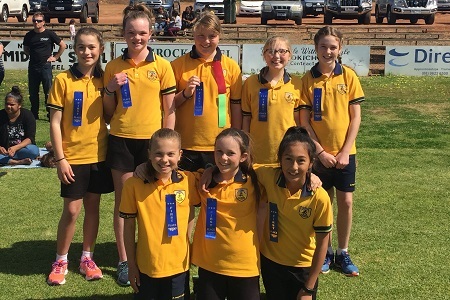 Congratulations to Braeden Lane, Madison Longmire, Quinn MacPherson, Antoinette Matres, Jacob Roberts, Jasmin Woods, Leah Morrell and Jesica Tony for proudly representing our School and competing well. Thank you to Mr James for preparing the team for the competition and accompanying them on the day. The Primary students have created a new playing area in the big sandpit and are looking for donations of old (safe) cookware and metal trucks etc. to use in the sandpit. Donations can be left at the Primary Admin Office. Thank you. 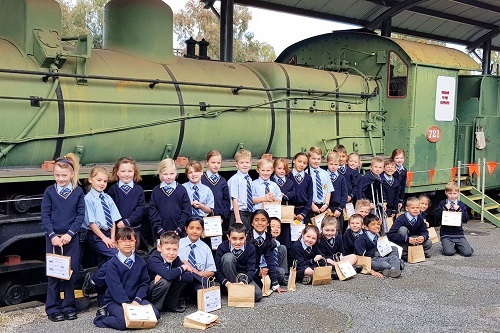 On Tuesday, the Year Two students went on an excursion to the Old Northam Railway Station. This was a part of their History unit leading into next term. Students were able to explore the olden day lifestyle by looking at certain objects and transport from the past. 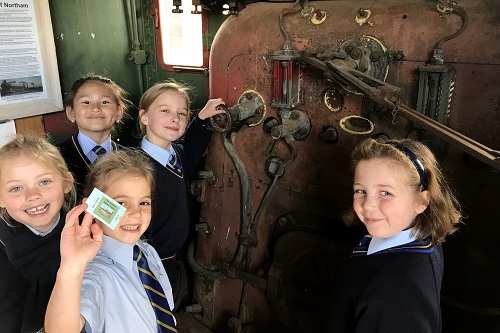 Students thoroughly enjoyed seeing an olden style train and seeing its interior and exterior features. 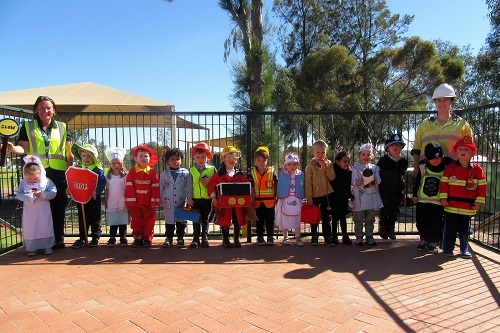 This term, we have been exploring the roles of Community Helpers. Each week we have introduced a new Community Helper and had exciting activities to explore. 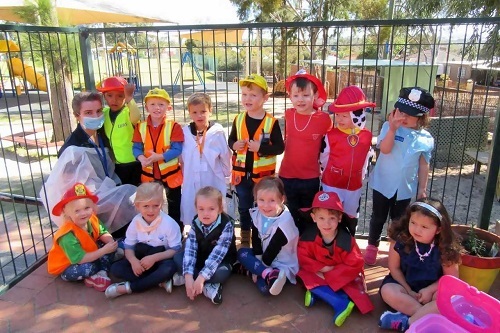 This week the children were asked to come dressed as their favourite Community Helper. It was wonderful to see a rainbow of Firefighters, Construction Workers, Police Officers, Hairdressers, Teachers, Doctors, Nurses, Farmers, Traffic Controllers and Chefs! 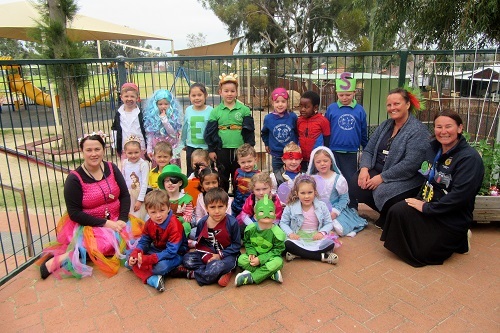 The Kindergarten students have been working hard to develop their early literacy skills. We have focused our learning on word identification, syllable segmentation, alphabet knowledge, onset and rime and phoneme-level manipulations. 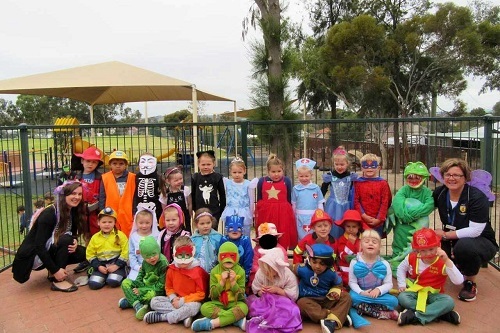 We invited the students to dress-up as something beginning with s, a, t, p, i, n, m, h, r, e, c, d, f, l, g, o, u, or b. You all looked fantastic! Year 9: Emma Pretorius, Lara Schmidt, Hollie Mather. Year 10: Harry West, Dalena Reynders, Audrey Carroll. 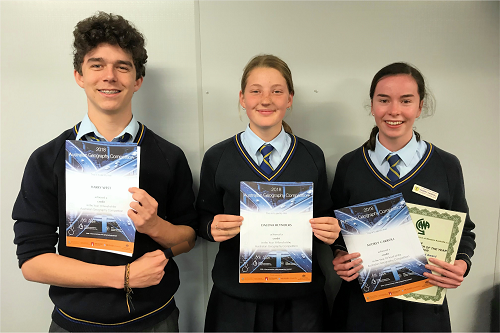 Congratulations to these students and in particular, to Jayde Williams (Year 12) who achieved a Distinction Certificate. 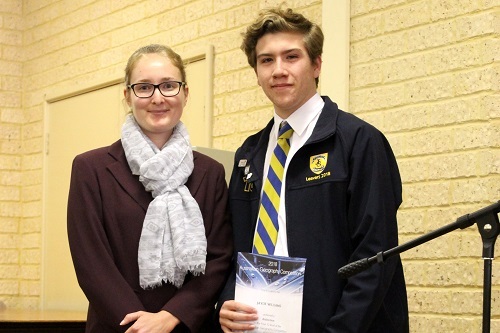 Two students, Alyssa Farrall (Year 9) and Audrey Carroll (Year 10) entered the Geographical Association of Western Australia 'Geographer of the Year' competition. 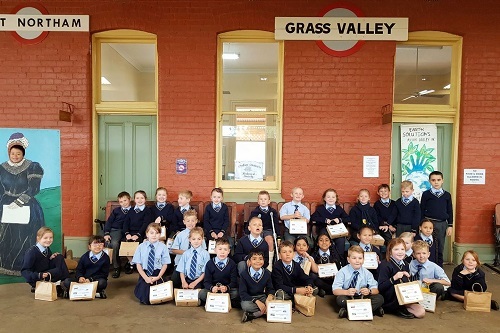 Both were awarded a Highly Commended certificate for their impressive efforts integrating information on their favourite place in Western Australia with key geographical concepts from the Western Australian Humanities & Social Sciences (HASS) Curriculum. 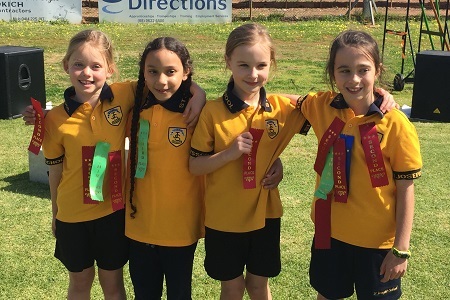 Well done to Alyssa and Audrey and to all our students who participated in the Australian Geography Competition. Every two years, St Joseph’s School endeavours to take a group of Years 9 and 10 students on an educational tour of Canberra. In 2019, it is anticipated that the tour will occur from 22 to 29 September, the first week of the school holidays. This tour has always been extremely competitive and students have a wonderful time exploring the Nation’s Capital as well as engaging in fun and exciting social activities. Students have been provided with an introductory session regarding the application process for the trip and a parent information evening will be held on Wednesday 17 October which is in the second week of Term 4, 2018. If you would like to attend the parent information evening, please RSVP to rebecca.doughty@cewa.edu.au or leave a message on 9621 3558. The Years 9 and 10 Drama students have been working hard to develop their characters and acting skills in preparation for our “Cloudchasers’ Carnivale” performance on Friday 16 November. Tickets ($5.00 each) to attend this year’s Drama performance to be held in the Northam Town Hall, will be available from the Secondary Admin Office from Week 2 next term. All proceeds will be donated to St Joseph’s Care. This performance is suitable for all ages and we look forward to seeing you all there. Parent Participation Levy cards are now due to be handed in to the Business Manager as soon as possible. These can be dropped into either Admin Office and Mr Johnson will arrange for the deduction of the Levy from your Fees Account. The P&F will be running a book raffle at the start of next term. Following the success of the Book Fair, we received some lovely donations from Scholastic Australia and families to run the raffle. If you would like to make a donation of a new book or stationery-type item, please drop them to the Primary Admin Office by the first week of next term. We hope to have a great range of prizes on offer and will post more details on ticket sales in the first newsletter (Week 1). The Shire of Northam wishes to advise all residents of the approaching nesting/breeding season of magpies. Magpies will swoop to protect eggs and their young from potential predators during the nesting season. They rely largely on intimidation by flying low and fast, often clacking their bill as they pass overhead. Magpies seem to sense fear and may continue to swoop on individuals. Occasionally, a magpie will actually strike an intruder on the head and while such strikes are rare, magpies can inflict serious injuries, with the eye the most common target. never deliberately provoke or harass a magpie. - walk away from the bird. avoid areas where magpies are known to swoop. wear a hat and sunglasses or carry an umbrella for protection. Magpies initially swoop from behind but can swoop back around. Remember, magpies are just trying to protect their young and birds generally only swoop for a few weeks during the breeding season. 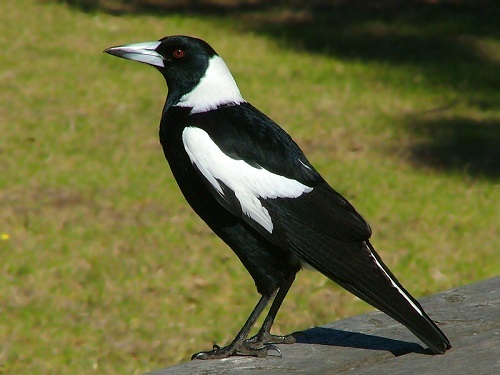 The Australian magpie is protected under State and Federal legislation. A fact sheet issued by the Federal Government’s Department of Biodiversity, Conservation and Attractions is available from the Primary Administration Office. Cricket Blast - Join the Fun! 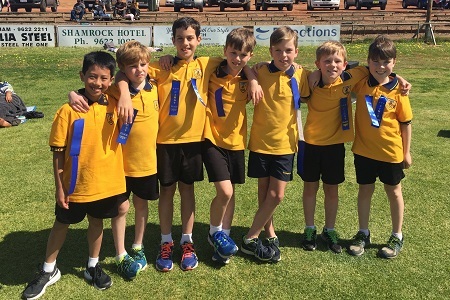 Northam Junior Cricket is hosting a Cricket Blast series to be held on Friday afternoons between 4.30-5.30pm at Bert Hawke Oval commencing on 12 October through to 7 December. There are two levels available: Junior Blasters for students aged 5 to 7 years and Master Blasters for students aged 7 to 10 years of age. Sessions will focus on basic cricket skills of throwing, catching and teamwork. 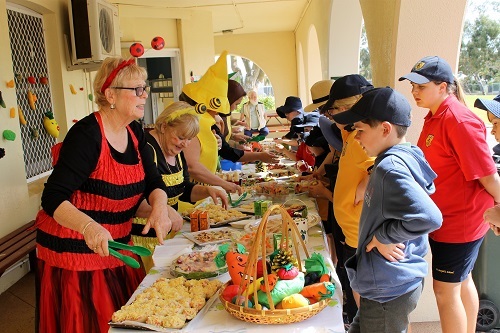 The October Inclusive holiday program will be offering another round of activities for school-aged children during the coming school holiday break. From Arts & Craft to team games, there will be something to appeal to all children. For those seeking a little more adventure, Northam PCYC will be running ‘Avon Colour Blast’ on Saturday 6 October [entry fees apply]. 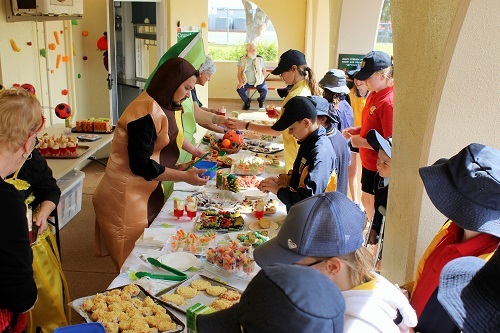 For full details of all activities offered in the program, please visit the Northam PCYC website. Bookings are recommended as some activities are limited in numbers. Registrations can be done online at https://www.trybooking.com/412568 , email: northampcyc@wapcyc.com.au or call Northam PCYC on 9622 2220. A limited number of programs and registration forms are available for collection from the Primary Admin Office. 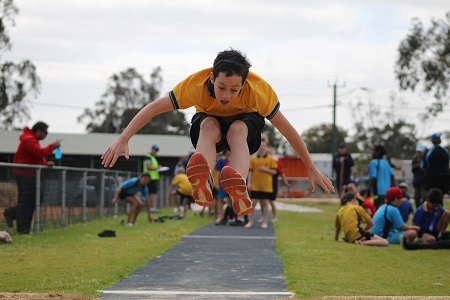 Northam & Districts Little Athletics Centre will commence on their 2018/2019 season on Saturday 13 October 2018. If you have any queries, please email northamdistrictslittleaths@gmail.com . For regular updates, we encourage you to follow us on Facebook. Celebrating a year of art projects with the York Noongar community, this exhibition features hand-made clay sculptures, animation and mixed media collages. Together, these projects share stories of the Noongar farm workers in the Wheatbelt as well as experiences of the Reserve, river, land and town expressed through the artistic hands of many generations. The exhibition will run from 8 September to 7 October 2018 on Fridays, Saturdays, Sundays and public holidays - 10.00-4.00pm at 110 Avon Terrace, York . Yarning session with Elders will be held on Saturday 22 September from 1.00-2.00pm. The exhibition is presented as part of Act-Belong-Commit 2018 York Festival. The Avon Valley Classical Concerts 2018 Spring Festival will be held in October. Three different concerts will be presented in historic venues in Toodyay, York and Northam on a Sunday afternoon commencing at 2.30pm on 7, 14 and 21 October. This year is our 15th celebration of Baroque Music, exploring the rich and varied repertoire of Baroque chamber music and performed by the Emanuel Ensemble. Please contact 9574 1591 for tickets - bookings are recommended due to the limited spaces available in the venues. Next term, students will make the changeover to summer uniform. Limited supplies of hats and caps are available for purchase at $10 each from either Campus Admin office. The Uniform Shop stocks all uniform items except school shoes and sandals. Black school shoes are to be lace-ups. The Uniform Shop will be open the last Friday of the school holidays, 5 October, between 9.00am and 12.30pm. Families who are new to St Joseph’s School in 2018 can access the Uniform Shop between 1.30-3.30pm by contacting Admin and booking a half hour appointment. 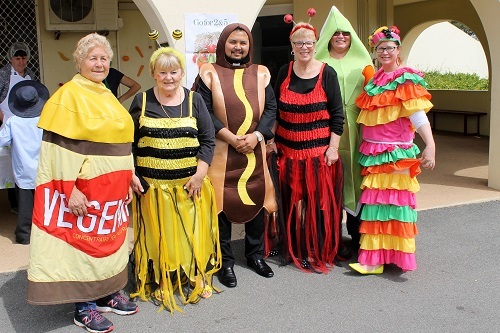 I would like to thank all our students and volunteers who came along and supported the Canteen for Fruit & Veg Day today. Our colouring-in competition will be judged over the holidays and winners (and prizes) will be announced at the Assembly on Grandparents Day next term. I would also like to thank all our parents and families who have volunteered their time in the Canteen during the Term - it is greatly appreciated and the children love to see a familiar face at the window. Please remember that even if all you have is an hour or two one morning, you are very welcome to contact me to go on the Roster in Term 4..